This splendid bouquet of warm pink roses and alstroemerias is suitable for any occasion and is sure to leave the recipient delighted! The combination of the flowers' soft pink tones with the intense green of the leaves makes this bouquet incredibly attractive to look at. Quite simply, it's the kind of bouquet capable of cheering up any room of the house when placed in a vase. 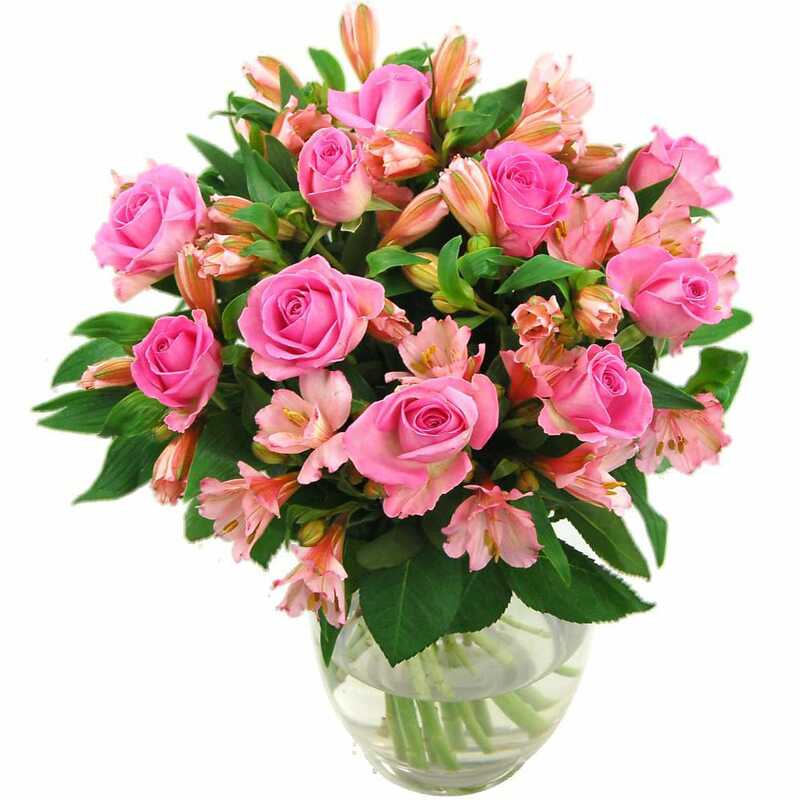 Why not send the Pink Rosmeria Bouquet to a loved one to celebrate a birthday or anniversary? Or better yet, lend a touch of colour and vibrancy to your own kitchen, bedroom, dining room or living room with this pretty flower bouquet. Graced with bright green leaves to feature a classy highly contrasted bouquet and hand-tied by our experts florists, you can get the Pink Rosmeria arrangement for just £34.99. It can be delivered seven days a week and qualifies for next-day free standard flower delivery to any address in the UK. When you order your Pink Rosmeria Bouquet from Clare Florist, you can also take advantage of an array of additional options to make your bouquet deliver a thoughtful and even warmer wish. Why not adding a tasty box of chocolates - ideal for making the ultimate romantic statement! Another great option is our selection of tasteful handwritten cards - you choose the message to accompany your bouquet, meaning that even when you order flowers online, you can still make every bit as personal as if you were handing them over in person. And if you love the Pink Rosmeria bouquet, have a look at the rest of our lovely new Rosmeria range, including the Rosemeria Red, Rosmeria White, Rosemeria Yellow and Rosmeria Peach bouquets, all featuring gorgeous rose and alstroemeria.